Not sure which foods to feed your poodle puppy or adult dog? Dog food reviews can help you find the right poodle food with the right balance of nutrients and vitamins. Holly was a very finicky eater and refused dog food, so we had to find alternatives for her. If you do feed your pooch dog food, you'll want to make sure you are giving her the most healthy food you can find. One that is as natural as possible without a lot of unhealthy, filler ingredients. 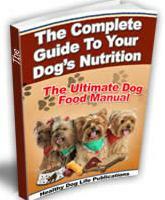 I highly recommend, The Complete Guide To Your Dog's Nutrition; it'll open your eyes about some truths about dog food. The food reviews look at both commercial and homemade dog food to help you pick the safest and healthiest food for your beloved poodle. This book is essential if you want to ensure your poodle receives the healthiest food out there and is getting the essential daily nutrients she needs. Help avoid the tainted and potentially toxic dog foods on the market by reading the dog food comparison information. And while preparing your poodle's food at home may be a better choice, there are certain foods he should not be fed, and this book tells you what to avoid feeding him to avoid serious illness. Did you know onions shouldn't be fed to dogs? This book helps you make sense out of dog food labels and gives you advice on choosing healthy and safe food for your dog. Your poodle's diet is essential to her good health, just like it is for humans, and this book teaches you how to choose healthy dog food - both commercial and homemade. You'll learn 12 of the best dog food brands and what the ingredients are, read an in depth discussion on homecooked food and pet food recipes, the BARF diet and more. I think you'll be shocked at how common table scraps can be lethal to our poodles. The book is essential for helping you make the right dog food choices and learning how to make nutritional adjustments to help your poodle's current health issues. There's also information on finicky eaters (Holly!) and how to manage them, and dog food brands that have been recalled. 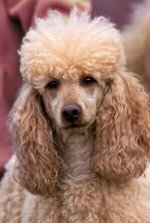 It also gives you a lot more information on your poodle's food and health including understanding her exact nutritional requirements, overcoming her food boredom, diets that help prevent bladder and kidney stones, the amount of fats and carbs he needs each day, and wet versus dry dog food facts. 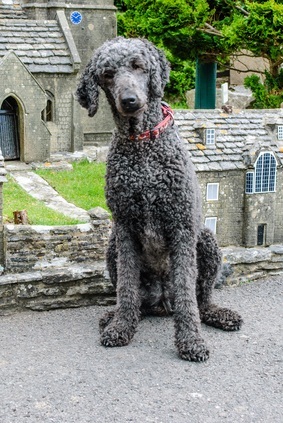 We hope reading some dog food reviews let you choose your poodle's food with confidence. We all love our pets and want the best food we can get for them. Poodles, like their owners, are what they eat. And a diet free of fillers, unhealthy trans fats and dangerous ingredients are the only foods we want them to put into their bodies, just like their owners!